Originally constructed in the 30's, this building has been renovated inside and out to create an environmentally responsible business centre that harvests rain water, recycles grey water and uses solar and energy-efficient heating and lighting systems. 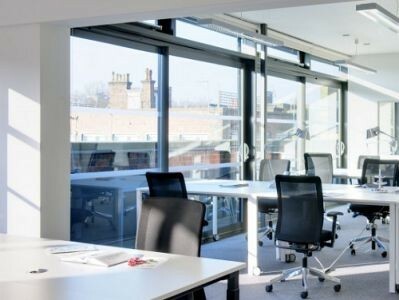 The offices themselves are bright and modern spaces with broadband and WiFi connectivity, and can be securely accessed at all hours of the day. The business centre boasts a rooftop terrace with fantastic views, lounge areas on every floor, and seven meeting rooms. A secure bike shed is also available as well as showers and telephone booths. 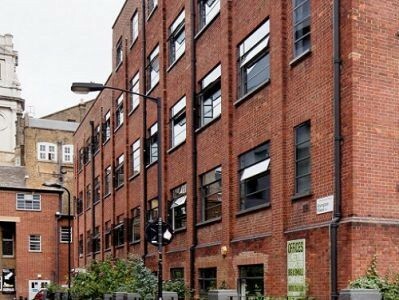 A short walk from Old Street and Whitechapel tube stations, as well as other public transport facilities, in the heart of London's creative & tech centre: Shoreditch, commonly known as Silicon Roundabout or Tech City. The local area is populated with interesting pubs, restaurants and venues as well as heritage attractions. Rivington Street runs from Old Street and Great Eastern Street in the west to Shoreditch High Street in the east. With an eclectic mix of businesses, the road is pedestrianised between Charlotte Road and Rivington Place. The road is lined with shops, galleries, bars and restaurants and there are plenty more within a short walk thanks to Rivington’s location in the heart of Shoreditch. The beautiful Shoreditch Town Hall sits north of Rivington Street, providing one of many options to rent space for corporate events. With numerous bus routes serving Great Eastern Street and Shoreditch High Street, the area is also linked to the rest of London at Old Street tube station east of Rivington. London Overground services are also available to the south-east at Shoreditch High Street station.